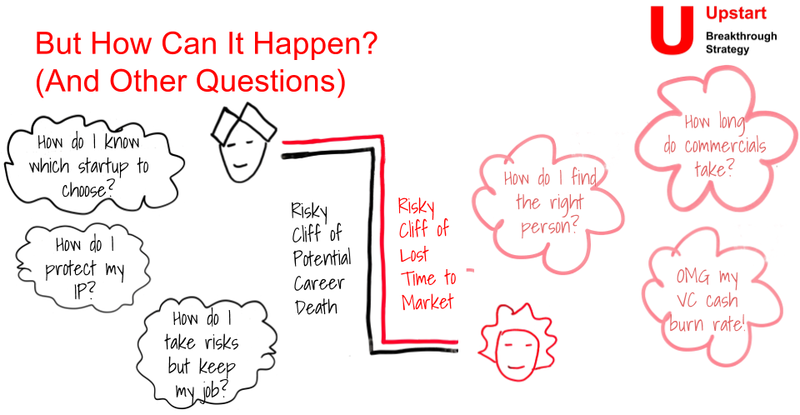 Start Here: The Upstart Breakthrough Strategy Blog - Read / Write Pharma Part 4/6: What if? Read / Write Pharma Part 4/6: What if? In previous posts we've met Ilse, Giles and Harriet. Ilse is still unwell. Pharma Giles and Digital Harriet are imagining how they can help her get better together, but both are having dark thoughts. Harriet and Giles have both heard of each other but never been in touch. Remember they’re both good people. Ultimately they want to help Ilse. And both of them have been thinking: "what if we could help her together?" Separately they've been thinking: "what if we put our stuff - our APIs and different kinds of evidence together?" It could be a marriage made in heaven. With Harriet’s help, Giles could access real-world data which his healthcare payers and providers are now beginning to ask for. With help from Giles, Harriet could use Fictitous Pharma's market access to reach people who are genuinely in need and who are not so engaged with their health. Of course, having the idea is the easy bit. And as they think about how it might happen, thoughts of a darker - and more personal nature - begin to surface. The truth is both of them are looking at a cliff face. Giles is at the top of his career. He is looking down at Harriet and quite a few other start-ups which are emerging in this space. And then he thinks: how is he going to get any partnership through his risk-averse legal, compliance and business affairs? “How will I protect my IP, confidentiality, and brand?” he muses. Most importantly he’s asking how he can take risks yet keep his job, his house (and not forgetting his golf club membership). The reality is that Giles is staring down the risky cliff of potential career death. Down at the bottom Harriet is also seeing a precipice. Only hers represents the risky cliff of lost time to market. She’s asking whether Giles is actually the right person at Fictitious Pharma, and if not, how does she find the right person to talk to about a partnership? She is wondering how long the commercials will take. The last pharmaceutical company she dealt with took three weeks to complete a CDA. And she’s wondering how she justifies this potential cash burn to her increasingly anxious Venture Capital-heavy board. How can Molecules talk to Algorithms? It’s no surprise that they should both find this difficult. The reality is that there is not an easy way for molecules to talk to algorithms. Both have grown up in very different environments. Pharma has developed an industrial culture of risk management and control and has a push-only culture. The algorithms which are driving digital health and the rest of the digital economy are born in a post-industrial environment of extreme risk, uncertainty. They are pushed and pulled from one service to another. So making them play nicely is impossible. And right now - with one or two notable exceptions - Pharma is not coming up with the answers. Pharma and digital services want to work together and see huge opportunities in partnerships. Both parties see a cliff face of uncertainty, risk and delay. Molecules and algorithms have grown up on different streets and can't talk to each other. In our next post we'll take a look outside health at how transport is getting a rewire, and what that can mean for health.